There's a lot of talk about Pinterest and Instagram today, and for good reason. For many businesses, it's possible to develop a following on these image-based sites and drive high amounts of traffic to your site. It isn't as difficult as you may think, either. If a mom-and-daughter-run website can harness the power of pinned images on Pinterest, your business and well-planned strategy can too.  As reported by Entrepreneur.com, a mom and her then-15-year-old daughter started PopCosmo -- a site they envisioned as being a teen trend spotting site focusing on their local area. It's true that they had a website that would naturally appeal to the demographics of Pinterest. If you don't think your site would quite fit in, maybe you're right, but there's still benefit to be had. I've even seen pins of products as mundane as portable storage containers go viral on social media channels; it really comes down to creativity and effort behind the campaign. Social media marketing is one of the three pillars of a successful SEO campaign, and Pinterest is a big player in the social media realm right now. Be Selective: Don't pin every single product in your store, every image from your blog, etc... Pin the best ones. Use Teasers: Don't give all the goodies away in one image or one image description. Create pins that relate to your products or service and give just a little info to guide them to your site for more. Add 'Pin It' Buttons: Just as you integrate social networks and sharing buttons on your website, be sure to add buttons that make it easy for other people to pin your images. Add a follow button for your Pinterest profile, too. Use Lots of Images: Use lots of images on your site so there's more for people to pin. Remember that you can pin videos, too! Pin Often, Pin Variety: Pin often. The more you pin, the more people who are likely to see one they like and re-pin, like, follow or comment. Remember that unlike other social networks, images on your boards have a long shelf-life. They aren't buried as easily as a Tweet. Don't just pin your own images, though. Repin, like, follow and comment other pins/pinners that are relevant to your industry or might be interested in your business at some point. Be personable. Pin Interests: Most people on Pinterest don't want to "see marketing". They want to find what they're interested in and they want to "see people". 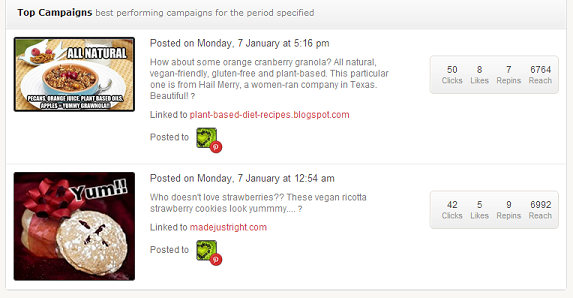 So as you have time, make boards on topics that interest you and pin and interact on those boards too. Pin Vertically: By vertically, I mean that literally... use images that are taller than they are wide. 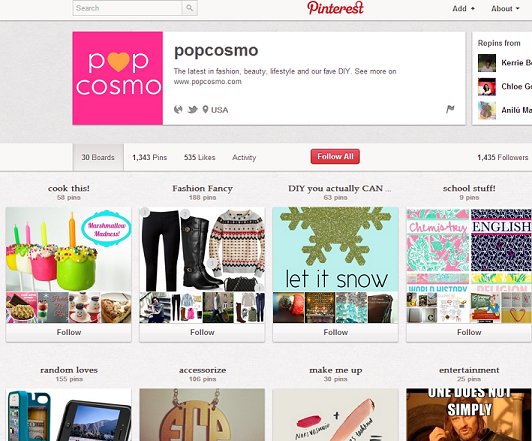 Because of Pinterest's layout, it will attract more eyeballs. Using dark borders on your image or adding text (think memes) can also help. Pin Mashups: Take several examples of something and combine them into a vertical image showing each on in a different block. Great for grouping favorite items, how-to steps, etc. Feature Customers: Make your customers feel special and they'll keep coming back. You can do that in many ways on Pinterest. 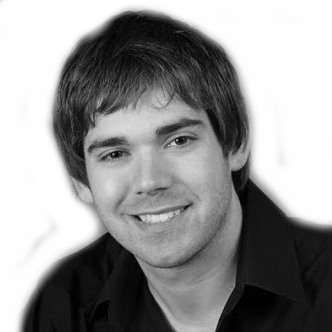 You could create a board where you feature a particular customer each week. You can hold contests that require repinning (or whatever you like) for an entry. Secret Boards: A new feature to Pinterest is secret boards. These can be used in many ways. You could offer a membership type board where only VIP members are invited to view and contribute to the board. You can even use it as a collaboration area for your employees. You could use it for private clippings and viewings of ideas for your landscaping, interior decorating, wedding planner customers (so many possibilities!). ShareAsImage (Was previously PinAQuote): Quotes and sayings are popular on Pinterest. If you aren't a graphics person it can be a challenge even to create a basic, good-looking quote. It's easy with this tool. Here you can easily create word-based images to share on Pinterest. Simply drag their button to your bookmark bar and it's ready to use whenever you are. WiseStamp: This is a really cool one, especially for a business. You can display your latest pins in emails that you send. This is a great way to gain new followers. Do you send out a newsletter? By all means, add this to it! PinPuff: Pin Puff is similar to Klout, but only used for Pinterest. It measures a user's influential potential and even assigns a monetary value to your pins. PinReach: I've saved my favorite free Pinterest tool for last. This one is incredible and something that they could easily charge for, in my opinion. The amount of data you can get is incredible, whether you're tracking your own profile and campaigns or you want to spy on other people. It assigns a score, kind of like PinPuff, but seems much more detailed and accurate. They have a 'guide' to their scoring system that kind of lets you know where stand in comparison to other users. The higher your score, the more influential or popular you are on Pinterest. Example: only 3 percent of users have a PinReach score of 40. The majority (45.7 percent) fall between a 20 and 29. And only .04 percent have fall between 60 and 69. 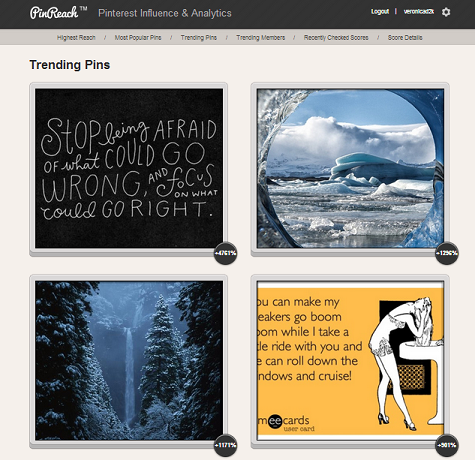 Trending pins: Here you can see pins that are trending right now. This shot has been cropped to keep it short, but they show way more than this. This is for trending pins overall. But if you look on your dashboard, you can also look at only your pins to identify your best performing pins (the ones with the most repins). If you click on a particular pin it will take you to the analytics page for that individual pin. There are many things on this site that make it my favorite free tool for Pinterest. I hope this look at Pinterest and the tools available are helpful as you move forward with your online marketing initiative. Pinterest isn't meant for everyone, but it sure can be helpful if your business is visually-oriented. Do you have any other tips for marketing on Pinterest? Let me know in the comments!